This pressure is perhaps most visible when it comes to the confrontation between energy demand and water supply. Twenty percent of water withdrawn in China goes to coal mining, processing, and power plants, which supply 70 percent of China’s electricity. These plants keep the lights on and the factories running. On the other side of the supply chain, factories spew pollutants – ranging from dyes used for skinny jeans to paints for toy train sets – into main waterways. The contaminated water is either treated – a process which carries significant energy costs – or, as is too often the case, leaches underground and ends up in irrigation systems, the lifeline of the nation’s food supply. At the same time, China is undergoing the greatest human migration in modern history. By 2025 an estimated 350 million people – more than the entire U.S. population today – will be added to China’s urban areas. Water and energy are required inputs for the steel and cement needed by these new and growing cities, as well as the acquired tastes of new urbanites, such as air conditioners and meat-intensive diets, further driving demand. The implications of this water-energy “choke point” are far-reaching. China is importing water-intensive crops and shoring up energy resources abroad. While agriculture is responsible for the majority of domestic water pollution, the water required for the energy sector will continue to grow in the next few decades alongside demand. These competing priorities are a significant quandary for a country already facing a major water scarcity crisis (water availability per capita is one-quarter the global average). The China Environment Forum has explored this nexus for years through our “Choke Point” series with the journalists at Circle of Blue, and this year the 12th edition of the China Environment Series is also a special water-energy issue. In the opening feature of China Environment Series 12, Michael Davidson (Massachusetts Institute of Technology), Gretchen Greene (Ropes & Gray), and Mingming Liu (Natural Resources Defense Council) urge the textile industry in China, the world’s top apparel exporter, to adopt more water efficient practices and technologies that can lead to co-savings in water and energy. They point out that reducing pollution and water usage can also improve a company’s bottom line. The authors cite the Responsible Sourcing Initiative, spearheaded by the Natural Resources Defense Council and a group of apparel retailer and brand partners, which laid out 10 best practices to improve water efficiency, ranging from insulating pipes to reusing cooling water. Together the techniques “can save 25 percent of the water and 30 percent of the energy used in a typical cotton fabric dyeing mill in China, all with initiatives that recoup costs in less than eight months,” they write. International Rivers’ Peter Bosshard and Katy Yan discuss the balancing act of water and energy management in China’s herculean dam-building efforts. It’s estimated that China is home to about half the world’s 45,000 large dams, spurred by exploding demand for energy since economic reforms in the 1980s. Bosshard and Yan write that this dam-building spree is not only disruptive to local ecosystems and communities, but increasingly spreading to China’s neighbors. They cite a recent offer to help finance and construct five large dams in ethnic conflict zones in Myanmar, as an example that could have significant environmental and political repercussions. China’s ability to scale up infrastructure and new technologies at dizzying speed has thus far sustained the country on an all-out sprint to fill the hands of eager global consumers and meet the growing needs of its citizens. Without proper coordinated water and energy management, however, the country will inflict irreparable harm on its environment, affecting air, water, and food quality for generations. Can China keep pace with its own growth without destroying the environment? As the world’s manufacturer, how China manages the water-energy nexus will have ripple effects across the global economy and environment. Download ‘China Environment Series 12’ from the Wilson Center’s China Environment Forum. Sources: CNN, ChinaDialogue, McKinsey Global Institute, U.S. Energy Information Administration, The Wall Street Journal, World Bank. 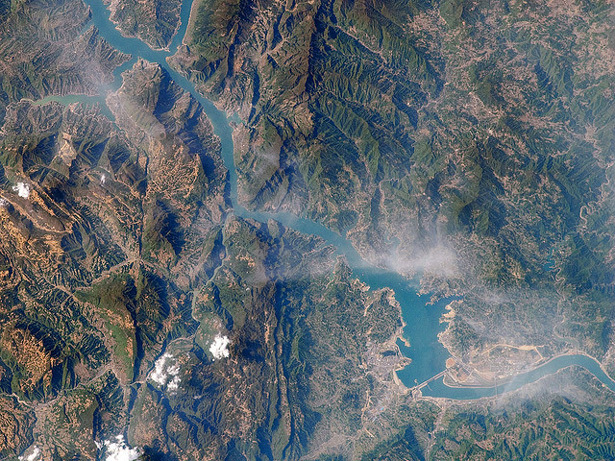 Photo Credit: Three Gorges Dam in 2009, courtesy of NASA and flickr user Euclid vanderKroew.